"Filmed with all the spectacle of King Solomon's Mines, the drama of African Queen, the passion of Snows of Kilimanjaro and the majesty of Lawrence of Arabia. It is a spectacular adventure you will always remember and a beautiful love story you will never forget!" Shout At the Devil saw Roger working again with Gold director Peter Hunt and producer Michael Klinger to adapt another Wilbur Smith novel. A number of capable hands from the James Bond films added their expertise besides Hunt. Maurice Binder, Derek Meddings, John Glen etc. The film is based (loosely) on the sinking of the SMS Königsberg. Shout at the Devil was the most expensive film made in 1976, costing around $9,000,000. Michael Klinger again provoked controversy by shooting in South Africa with South African finance. What did Klinger do in between Gold and Shout At the Devil? He produced the Confessions films with Robin Askwith! The headline star besides Roger was Lee Marvin. Roger seemed to like Lee Marvin in his memoirs but did say that the American actor was frequently as p****** as a newt on the set. When they did the fight scene between their characters Roger wrote that Marvin was drunk and - with a red mist in his eyes - threw punches for real! Lee Marvin apparently got into a fight with Japanese journalists when he arrived to start production. It seems this actor could create a rumpus in an empty room. Shout At the Devil wasn't marketed very well in North America and so was somewhat underexposed there and wasn't really a blockbuster but it has held up fairly well over the years and is generally regarded to a decent old-fashioned period action film with some nice production values and special effects. This is the sort of film they don't really make anymore in these CGI festooned times. It used to be that if you made an adventure film you had to travel and shoot in real locations around the world. Shout At the Devil is from that old school era of filmmaking. There are no plastic jungles or green screen computer generated rivers in this film. Zanzibar circa 1913. 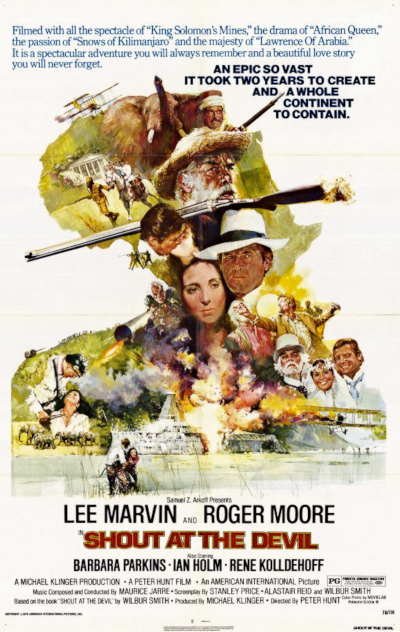 The boozy Colonel Flynn O'Flynn (Lee Marvin), an American in Africa, takes advantage of gullible British toff Sebastian Oldsmith (Roger Moore) to pilfer ivory from German controlled territory. But O'Flynn and Oldsmith draw the predictable fury of the wicked Herman Fleischer (Reinhard Kolldehoff), the German Commander of Southern Province. Shout At the Devil has too much plot for its own good at times but despite the fairly lengthy running time this is a relatively solid period caper with plenty of action. The film is dated, as seventies adventure capers tend to be, but it is competently made and the action is well staged when it arrives. Peter Hunt is a very safe pair of hands here. Bond fans have often wondered why Peter Hunt didn't direct any more Bond films after 1969 but he always claimed he was it was down to timing. They always seemed to ask him when he was already working on something else. Hunt wasn't too bothered by this though and was very happy with the way that the films he made with Roger turned out. "Whilst I've often been disappointed about things I wanted to do that never came off," said Hunt, "I've done some films that I'm awfully proud of which are out of the Bond idiom, away from the protected society of Broccoli and Saltzman and all that. 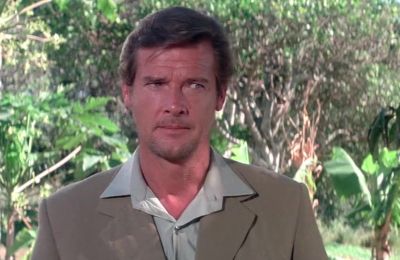 It was very protective for me, and very nice and good, but I was able to go off and make my own films, like Gold and Shout at the Devil, both starring Roger Moore, which I'm proud of and which were very different from Bond." Lee Marvin is well cast as O'Flynn in Shout at the Devil. As he was genuinely two sheets to the wind on the set he presumably didn't have to work too hard to get into the character of a whiskered drunkard. This is the let it all hang out super broad Lee Marvin rather than the stoic strong silent Lee Marvin. Marvin works pretty well with Roger in the film as this mismatched pair of bounders. Part of the charm I suppose is that they don't even seem to be acting in the same film at times! The story has a dark twist that threatens to sour the general boy's own atmosphere but it's to the credit of Peter Hunt and the film that it manages to survive this change of gear without going completely off the rails. Shout At the Devil is a very incoherent film at times but the slapstick, action, and eccentricity keeps it ticking over where many long films might have stretched one's patience a lot more. One obvious problem though is that - even with the knowledge that this is a period film - it's a bit hard to summon much sympathy for the characters when they apparently exploit elephants for profit. Big game poachers and those in the ivory trade are obviously best deployed as villains. Leave the elephants and animals alone I say. Reinhard Kolldehoff chews the scenary up as the evil Fleischer and makes a decent baddie. 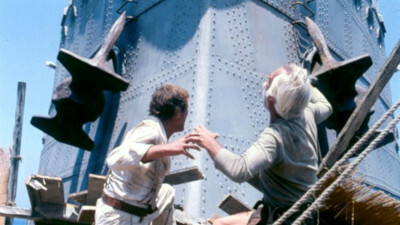 The film has a believable sense of location and the period detail is well handled with the costumes and old boats and ships. The score by Maurice Jarre also serves as a stirring backdrop to the mayhem and images onscreen. It's quite a novel element also to have a World War I era film that isn't set in Europe. We forget that the tentacles of that conflict had ripples in some far flung places. Roger is somewhat on the old side by now to be playing the boyish romantic lead but he just about gets away with it (mainly by looking younger than he actually is in real life) and throws himself into the film as best he can. A big fight scene between Lee Marvin and Roger is enjoyably long and daft and like something out of an old Western. Oldsmith is a character that's hard to believe in at times but Roger does his best with the various strands he has to pick up. Some require him to be suave and others grim. Ian Holm is quite amusing as Marvin's mute sidekick and Barbara Parkins is good as Rosa. Shout At the Devil is no classic and falls short of Sean Connery's The Man Who Would Be King but it passes the time and is worth a watch if you've never seen it before.